The story concerns a young woman called Rachel Verinder who inherits a large Indian diamond, the Moonstone, on her eighteenth birthday. The book is widely regarded as the precursor of the modern mystery and suspense novels. T. S. Eliot called it ‘the first, the longest, and the best of modern English detective novels’. It contains a number of ideas which became common tropes of the genre: a large number of suspects, red herrings, a crime being investigated by talented amateurs who happen to be present when it is committed, and two police officers who exemplify respectively the ‘local bungler’ and the skilled, professional, Scotland Yard detective. . . .Upon my honour, Betteredge, I think she must be wrong in the head! She said, 'They will never find the Diamond, sir, will they? No! nor the person who took it—I'll answer for that.' She actually nodded and smiled at me! Before I could ask her what she meant, we heard your step outside. I suppose she was afraid of your catching her here. At any rate, she changed colour, and left the room. What on earth does it mean?" I could not bring myself to tell him the girl's story, even then. It would have been almost as good as telling him that she was the thief. Besides, even if I had made a clean breast of it, and even supposing she was the thief, the reason why she should let out her secret to Mr. Franklin, of all the people in the world, would have been still as far to seek as ever. 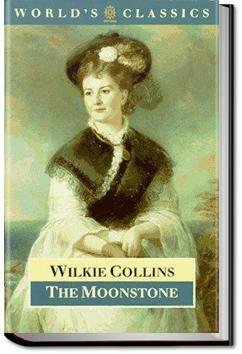 The Moonstone is known as the first detective novel*, and it's a cracking one. You can see things invented here that were directly borrowed by future writers: Holmes' overconfidence (and his use of London urchins as agents); Agatha Christie's exploration of narrative reliability.